The British Royal Family all went back to Windsor Castle today to attend the wedding of Princess Eugenie and Jack Brooksbank. Princess Eugenie, 9th in line to the British throne, is the daughter of Prince Andrew, The Duke of York and Sarah, Duchess of York; and is the younger sister of Princess Beatrice. Jack Brooksbank is the European brand manager for Casamigos, the tequila brand co-founded by Georges Clooney, Rande Gerber and Mike Meldman. Eugenie and Jack have been together since 2010 and got engaged back in January. Eugenie’s sister and Jack’s brother were respectively Maid of Honor and Best Man. Harry & Meghan arrived with the rest of the family, and were seated next to The Cambridges and Anne, Princess Royal. Meghan wore a Givenchy coat and dress paired with Manolo Blahnik heels, a Noel Stewart fascinator and a Givenchy clutch. She completed her look with jewelry from Pippa Small. You can find photos from the arrival/departure and the ceremony in the gallery. The wedding must have been quite special for Meghan & Harry as it probably reminded them of their own, which only happened 5 months ago! The public will have the opportunity to see Meghan’s dress and a replica of Harry’s uniform at Windsor Castle and at Holyrood Palace in Edinburgh in 2018 & 2019. From 26 October 2018 to 6 January 2019, A Royal Wedding: The Duke and Duchess of Sussex will form part of your visit to Windsor Castle. This special exhibition will feature the wedding outfits worn by the couple at their wedding in May 2018. The Duchess of Sussex’s wedding dress was created by the British designer Clare Waight Keller, Artistic Director at the historic French fashion house Givenchy. The Duchess chose Ms Waight Keller for her timeless and elegant aesthetic, and for the impeccable tailoring of her creations. The Duchess and Ms Waight Keller worked closely together on the design. The Duke of Sussex’s wedding outfit was the frockcoat uniform of the Household Cavalry (the ‘Blues and Royals’), made by tailors at Dege & Skinner on Savile Row. As the uniform specially commissioned for the occasion is required for use by His Royal Highness, an identical uniform made for The Duke by Dege & Skinner a few years earlier will be displayed. The dress is made from an exclusive double-bonded silk cady, developed by Ms Waight Keller following extensive research in fabric mills throughout Europe. True to the heritage of the House of Givenchy, the graceful lines of the dress were achieved using six meticulously placed seams. These extend towards the back of the dress, where the train flows in soft round folds cushioned by an underskirt in triple silk organza. One of the main features of the dress is the boat neckline bodice. The five-metre-long veil is made from silk tulle and embroidered with the flora of the 53 countries of the Commonwealth, a reference to an important part of The Duke and Duchess of Sussex’s official work following His Royal Highness’s appointment as Commonwealth Youth Ambassador. The Duchess added two of her favourite flowers to the embroidered decoration: Wintersweet (Chimonanthus praecox), which grows in the grounds of Kensington Palace in front of Nottingham Cottage, and the California Poppy (Eschscholzia californica), the State flower of The Duchess’s place of birth, California. Embroidered ears of wheat, symbolising love and charity, are symmetrically placed at the front of the veil, which is edged with embroidered organza flowers. Hi everyone ! We were all waiting for them, the official photos from the wedding have been released by The Royal Family. We can see the newlyweds with their family members as well as the Bridesmaids and Pageboys. The photos were taken by Alexi Lubomirski, who also did the couple’s engagements portraits. I have to say, the B&W photo of Harry and Meghan is probably my favourite. He was inspired by Audrey Hepburn in the 1960s. While some Internet commenters thought her hair—specifically her face-framing layers—looked too messy (a common and tiresome critique of Markle’s favorite style), Normant embraced her signature look. “It’s a messy bun, we call it. Messy in a controlled way,” he said. Normant was focused on “making sure it doesn’t become a whole mess after a few hours” without making the hair look shellacked. “I don’t overload the hair with products in general and certainly not on this day,” he says. As previously reported, British-born designer Clare Waight Keller designed The Duchess of Sussex’s wedding dress. She sat down with ITV to discuss the dress and the process. ITV – The designer who created Meghan Markle’s wedding dress said she was “truly privileged” and “flattered” to have been asked. Clare Waight Keller continued it was an “enormous honour” to have been given one of fashion’s most coveted jobs ahead of the royal wedding. 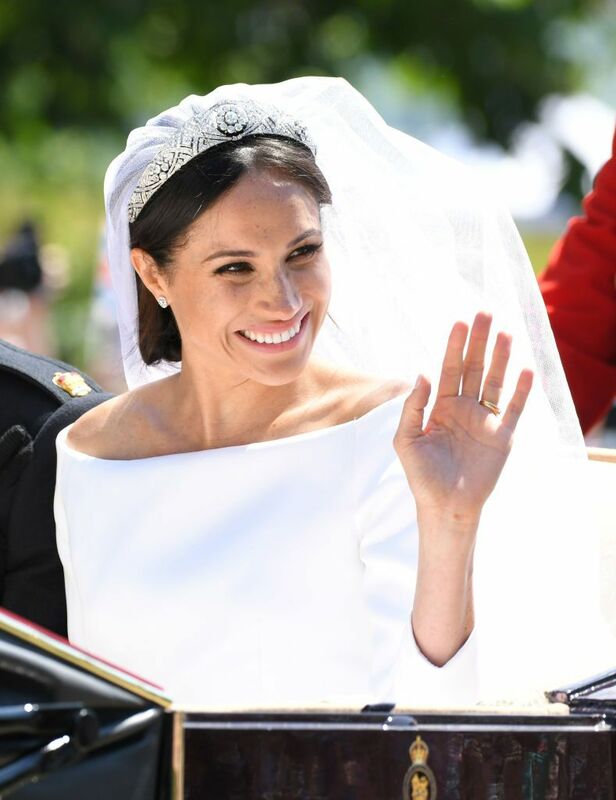 She added that the “momentous” task left her feeling “enormously proud” when Meghan “looked absolutely stunning and radiant” on her wedding day. The designer revealed that following the ceremony, Prince Harry told her that he thought his new wife “looked incredible”. Ms Waight Keller added that it was “an extraordinary thing to observe the whole ceremony” and see the “love in their eyes during the ceremony, it was just the most beautiful, poetic moment. Givenchy’s Artistic Director said that when she was approached with the commission in January, the now Duchess of Sussex already “had an idea of what she wanted” and the pair “worked very closely together”. The 47-year-old said she wanted to capture the former actress’ “modern, fresh” style in the dress, but also make her “feel absolutely incredible in the dress and also I wanted her to feel like it was absolutely right for the occasion”.